MassPlus for Windows - Section Properties calculator for AutoCAD drawings. Updated release date April 3, 2019. Free evaluation version. View and print AutoCAD DWG and MicroStation DGN files. Calculate section properties (moments of inertia, section modulus, etc.) software.Now supports Win 7 and Win 10, mesh display, splines, plastic section modulus Zx and Zy, and thru AutoCAD 2017 drawings. Click here for new features. New version directly interfaces with AutoCAD via autolisp. Selected entities for calculation are now displayed in the MassPlus graphics window. Results may be exported to CSV (Excel file) . 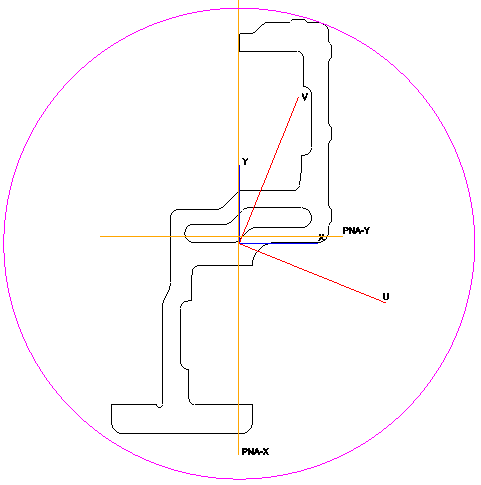 Can your AutoCAD software calculate area properties for a complicated section like this? MassPlus v9.0 can! Easily! MassPlus is an engineering software application which calculates the area properties of any two-dimensional AutoCAD geometry. One common application is for analyzing steel section properties and aluminum extrusions. MassPlus supports exported 2D profiles from 3D packages like SolidWorks, etc. New version 9.0 supports the newer versions of AutoCAD. See also frequently asked questions mpfaq.pdf. “Versatile software and excellent customer support.” Tim VanderMey, Proton Design, Inc.
“MassPlus is a very handy software for the oddball shapes we run in to. It computes all the properties we require to run our analysis. The customer service and e-mail response time is top-notch.”-Nicholas Valentin, P.E. 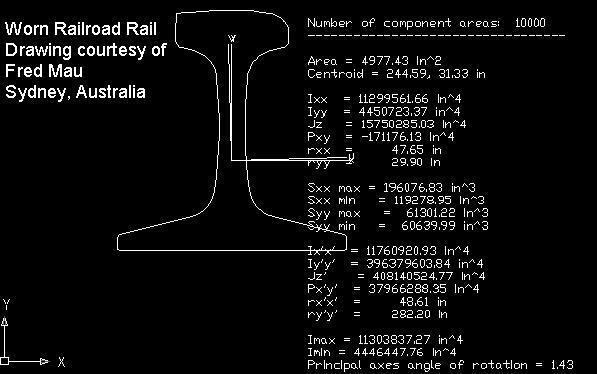 The centroidal axes are also displayed providing instant visual confirmation if the section is being correctly analyzed. Note: Compiled HTML Help Files (.chm) must be saved locally using "Save" before you can see the topics! Simply Opening the file will not work! This is a Microsoft security requirement. Free calculation offer. Instead of providing a trial version, CSUI is now offering free calculation for one shape per user. Email sample drawing to mpsales@slickwin.com and CSUI will send you the results. Please do not send raster images such as jpgs, tiffs, etc. The drawing must contain only one shape! All drawing entities that are not part of the shape such as dimension lines, text, graphics, and unexploded regions, must be removed and that the shape is hatchable before submission. MassPlus v9.0 is priced at $99.00 per single-user license for a Two Year license. Upgrade pricing for existing users of MassPlus is $79 per single-user license. Also available from CSU - SlickViewPlus! and SlickPdfPlus View AutoCAD , HPGL, cals g4, tiff, jpg, jedmics, plus over 200 file native formats. Difference between MassPlus Classic and MassPlus XG mpcompare.pdf.